After one takes epicanthoplasty with the removal of the Mongolian fold, the eyes might look awkward than before, or one may want to go back to the previous look when he/she had a scar. When the eyes look severe, it is actually because of the complication caused by poor surgical experience and techniques. When a scar is largely remained, it is mostly caused by the surgical line. In cases like these, the removal of the Mongolian fold was not done effectively and caused only a negative change on the eyes. When one wants to undergo the restoring surgery, it must be understood that it cannot be recovered like before completely, and it may not give you the best results. If you would like the restore your Mongolian folds, it would be better to improve them properly by the Magic epicanthoplasty with restoring damaged structure of the inner corner of your eyes. Then, this can produce desirable results with natural eye appearance. 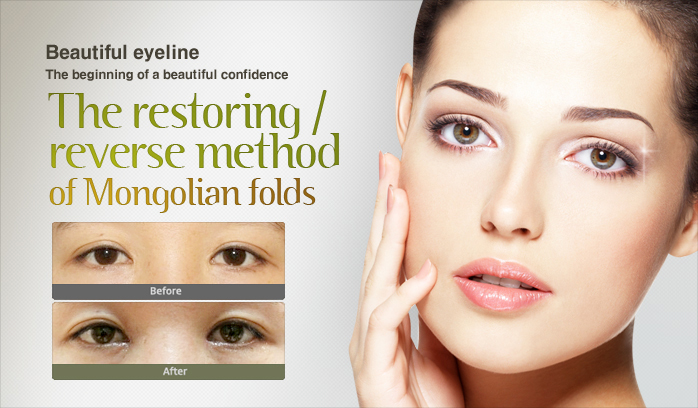 Simple restoration of the Mongolian fold make the inner corner of the eyes look as if closed. In fact, many of the patients who have undertaken the restoring method are undertaking the epicanthoplasty again. The aim of this surgery is to give improvement and recover the structure of the inner corner of the eyes, and improve a previously remaining scar.